With the brake drum removed, clean the brake shoe lining contact surface of the brake drum with denatured alcohol or an equivalent approved brake cleaner. Light surface rust can be removed with an abrasive disc; heavy surface rust and/or pitting must be removed by refinishing the drum. If the braking surface of the brake drum exhibits one or more of the braking surface conditions listed, the drum requires refinishing or replacement. Using a brake drum micrometer calibrated in thousandths-of-an-inch, measure and record any grooves present on the drum braking surface. Ensure that the measurements are only taken within the brake shoe lining contact area. If the brake drum scoring depth exceeds the specification, or if an excessive amount of scoring is present, the drum requires refinishing or replacement. Mount the brake drum on a brake lathe. 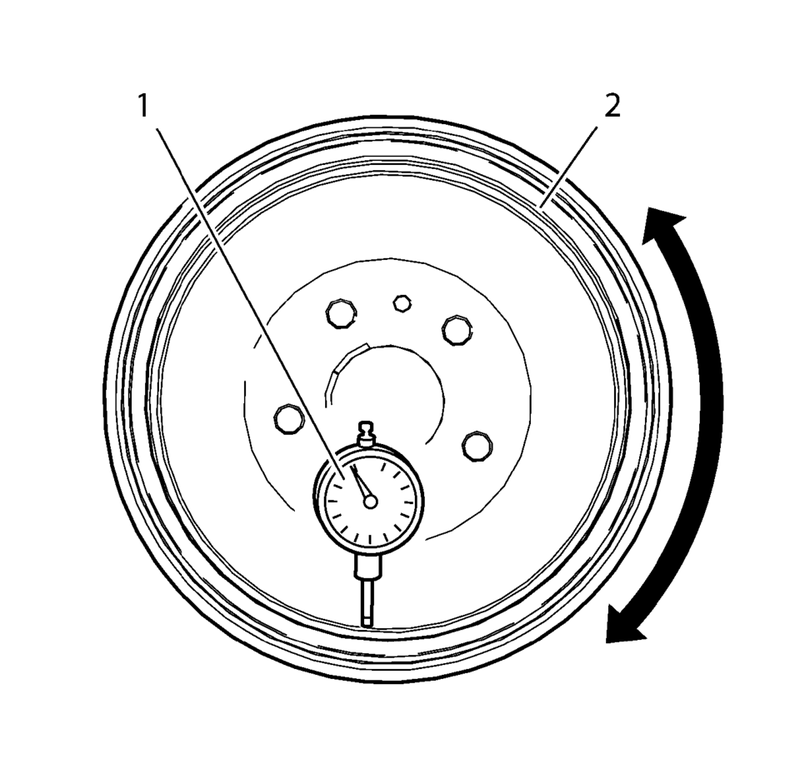 Mount a dial indicator, CH-8001 indicator (1), or equivalent, and position the indicator button so it contacts the braking surface of the brake drum (2) at a 90 degree angle, approximately 19 mm (0.75 in) from the outer edge of the drum. 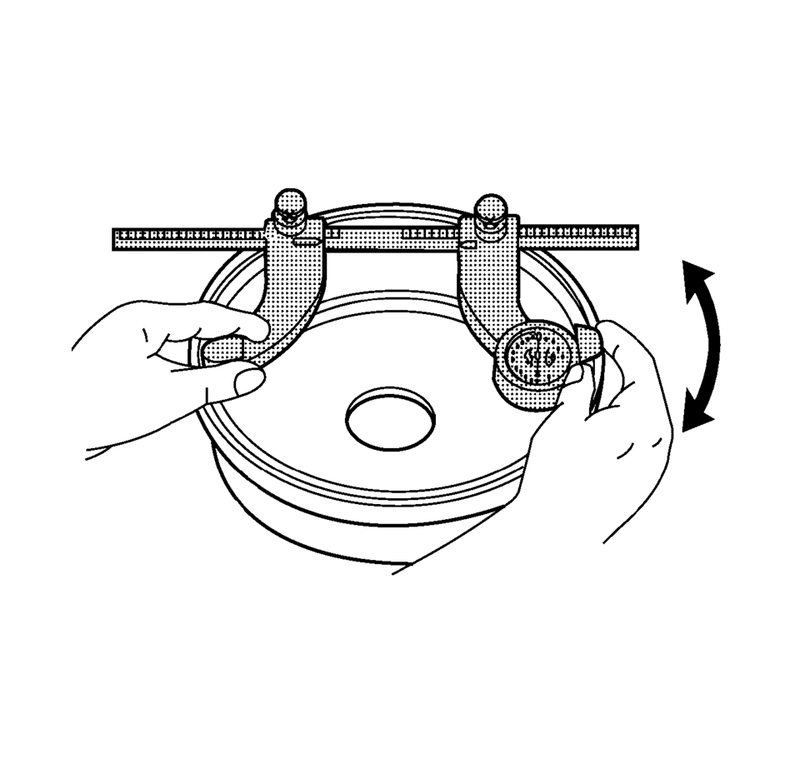 Measure and record the radial runout of the brake drum. Rotate the drum until the lowest reading is displayed on the indicator dial, then zero the dial. Rotate the drum until the highest reading is displayed on the dial. If the brake drum radial runout exceeds the specification, the drum requires refinishing or replacement.